Mid-range, but there's nothing mediocre about this home cinema system, which really shows the competition how it's done. LG has been playing the style card a lot recently, and it's paying off. The LG HT953TV may only be a mid-price DVD system, but the elegant speakers and glossy black styling perfectly match the current crop of luxurious glossy black ﬂatscreen TVs. In fact, it could be the ideal partner for a posh plasma or LCD telly – it offers 1080p upscaling, an HDMI input and enough power on tap to ﬁll your front room with genuine 5.1 surround sound. We've seen a lot of all-in-one systems shedding their rear speakers and relying instead on pseudo surround effects with a varying degree of success, so it's refreshing to ﬁnd LG combining innovation with a full quota of speakers. But the Korean brand has gone even further by using its own digital sound processing to create – get this – virtual 10.1 surround sound. And with legendary high-end audio guru Mr Mark Levinson onboard, it seems LG is really pushing the audio capabilities of its all-in-one systems. The impressive-looking tower speakers are mostly plastic with some metal reinforcement, but LG's 'champagne ﬂute' design is a big step forward, making the competition at this price look distinctly clumsy. Lifting all of the tweeters high puts them level with your ears, and endows them with a serious sonic advantage in terms of sound-staging. Of course, a more solid front pair would deliver extra weight, but with the powerful subwoofer on hand to reinforce the low-end, LG has pitched this speaker system just right. a heavy base plate, and the advantage with this form factor is all about space-saving and convenience. The vertical panel makes it easy to tap in your commands and read the display, while the slot-loading disc drive is touch-sensitive for that extra wow-factor. The LG HT953TV is pitched at the mid-price range, so there's no Blu-ray support or internal hard drive for storing music and video. That's not to say LG has been stingy with the features. There's a USB input that can play MP3 files from a ﬂash-memory storage device (and record onto it) plus a memory card reader and 30-pin iPod socket that'll fire all 'Pods and give you full onscreen control of your music and video through the remote control. or a games console, or set-top box. It's version 1.3, so passing a full 1080p signal with multichannel audio is no problem either. The tower speakers snap together easily enough, leaving a hollow channel at the centre for cable management and weighty metal feet at the bottom. They're quite stable, but if you have children or big dogs, you can be sure they'll get toppled at some point. Long runs of speaker cable with colour-coded plugs are supplied in the box, as is a generous 5m HDMI cable, so getting connected is painless. LG still hasn't polished its graphic user interface (GUI) to the extent of Sony's excellent Xross Media Bar system, but the basic graphics make it a fairly straightforward case of scrolling through the GUI to set the output resolution and tweak the sound to suit your room. It's reassuring to know that Mark Levinson himself has already tuned this system. It's not quite the megabuck pre-power hi-ﬁ that he's used too, but you can appreciate the effort that's been made here. 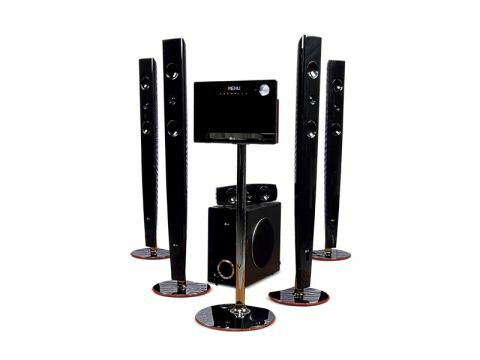 Those speakers don't sound as lightweight as you might imagine and with enthusiastic amplification, plus the robust subwoofer, this system can manage a masterful home cinema performance given a rousing soundtrack like the one on the Will Smith horror ﬂick I Am Legend. There's enough bass to fill a moderately large room from the sub and it's fast and accurate, leaving the towers to deliver an uncluttered mid-range and a descriptive treble. The tower design demands proper speaker placement around the room, so you will always have a cohesive soundstage from front-to-back. The centre does well to project Smith's dialogue through the mix. Switching from 5.1 to virtual 10.1 mode (via LG's Virtual Surround Matrix tomfoolery) brings an interesting shift in spatial perception; the room feels larger and the sound feels more dispersed. It's an interesting effect (it claims to add an extra four speakers to ﬁll the gaps between the satellites, plus an extra one ﬂoating near the centre channel), but to me it sounded processed and compressed. So while it provides certain scenes with a soupçon more atmosphere, you'll probably end up switching it off. There's a limit to how much volume you can give the LG system, too. Those plastic cabinets don't have the reinforcement of wood and the tweeters will start to sound a little harsh at the upper levels. LG's claimed 1,000W power rating should be taken with a massive pinch of salt. That said, as all-in-one systems go, this is one of the larger performers out there, and music sounds particularly exciting in surround sound. The DTS 5.1 mix of the Classic Beethoven DVD by the London Symphony Orchestra beneﬁfis from the open and enveloping sound available through these towers. This isn't one of Mr Levinson's hi-end hi-ﬁ's, though, so the two-channel mode is slightly underwhelming, but it's still above average for a DVD system. my BenQ W5000 Full HD projector. I'd suggest it's a case of discovering what looks the most realistic on your own screen. As for those additional features, the iPod dock is an obvious boon, given that statistically, we all now own at least one. The USB Host socket that allows you to play ﬁles from a USB drive is potentially useful and the FM radio sounds ﬁne – if you have decent reception. It's a real shame that Blu-ray technology hasn't ﬁltered down to this price point yet, as you can bet it will next year. But that doesn't mean you need to delay purchase; the LG's HDMI input means it is future-proofed in that regard.